The first official trailer for Netflix’s Orange Is The New Black confirms we’re stepping into a whole new world behind bars in the upcoming sixth season. The trailer finds our favorite inmates out of their (relative) comfort zone when they’re moved to a different prison. In addition to releasing the full trailer, Netflix has unveiled a poster for the upcoming season of the award-winning dramatic series. 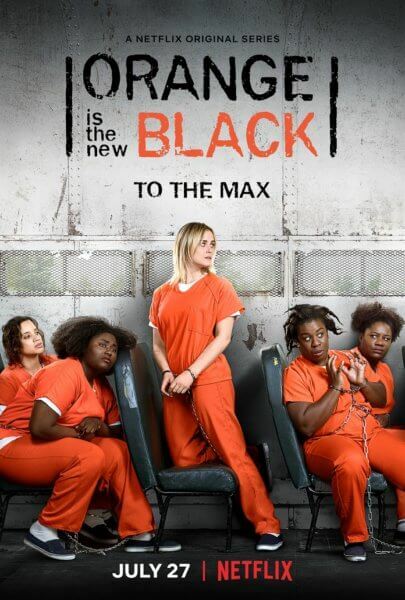 The cast of the new season includes Taylor Schilling, Kate Mulgrew, Jessica Pimentel, Selenis Leyva, Adrienne C. Moore, Natasha Lyonne, and Danielle Brooks. Netflix has set a Friday, July 27, 2018 premiere date for season six. The Orange Is The New Black Season 6 Plot: Picking up one week after the emergency response team stormed Litchfield Penitentiary, the ladies of Litch have been torn apart, literally and figuratively, as they enter a new facility in the sixth season of Orange Is The New Black. Now newbies they must navigate new rules and power dynamics, starting at the bottom, and getting hazed by inmates and tortured by guards. Friendships will be tested and new allegiances formed — some by choice and others by circumstance — as the women face a slew of charges from the riot. Will they take plea deals and turn on each other or band together and keep their bonds intact? A Look Back at Season 5: A riot sparked by Poussey’s death quickly escalates when the inmates gain control of the prison. Once they get a taste of power, chaos ensues through the halls of Litchfield. In real time and over the course of just three days, season five of Orange Is The New Black will leave the inmates’ lives forever changed as they are emboldened to fight for redemption, resolution and the respect they deserve.